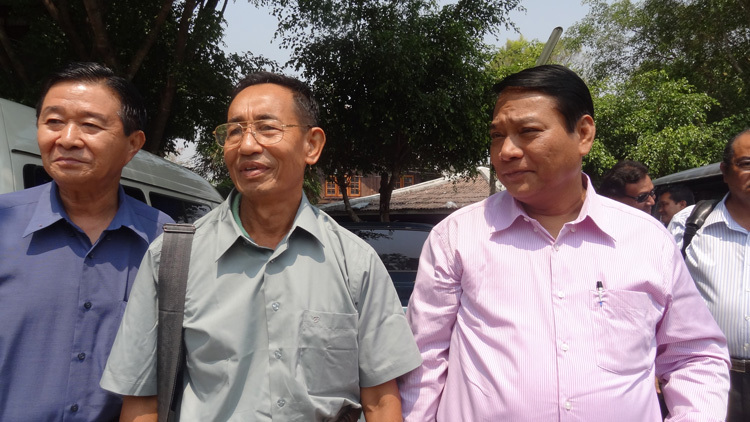 The Karen National Union leader, Padoh Mahn Nyein Maung, who was sentenced to life plus three years on March 13th, has arrived back to his organization, the Karen National Union. Padoh Mahn Nyein Maung was released under an amnesty issued by Burma’s president, U Thein Sein, on March 19th. Padoh Mahn Nyein Maung spoke to journalists at Mae Sot. The Burma Government’s railway Minister representative Aung Min gave a short message to journalists in Mae Sot as he handed Mahn Nyein Maung over to the KNU. The government representatives and Karen National Liberation Army chief of staff, General Mutue Sae Poe along with other KNU leaders meet in Mae Sot. As more details become known about the discussions Karen News will report. KNU general secretary, Naw Zipporah Sein, General Mutue Sae Poe, Major General Mae Aye Sein, Lieutenant Colonel Roger Khin, Padoh Saw Kwe Htoo Win, Padoh Saw Shwe Maunn, Brigadier General Dah Kyaw Hla, Colonel Ner Dah Mya, Padoh Saw Thawthi Bwe, Colonel Saw Htoo Htoo Lay and former Major Ka Ner Mi attended the meeting with the Burma delegation. Padoh Mahn Nyein Maung was sentenced to life plus three years under Article 17/1 and 122/1 by the acting judge, U Hla Win on March 13th at a court inside Burma’s notorious Insein Jail.